I n the period 4-6 October, an Antibiotice team participated, for the 14th consecutive year, in the international fair of products and pharmaceutical ingredients, Chemical and Pharmaceutical Ingredients Worldwide (CphI Worldwide), held this year in Barcelona. The presence of the Antibiotice delegation at the most important fair of the world pharmaceutical industry creates many opportunities for exploiting our product portfolio in the foreign markets. “Our participation in CphI creates valuable opportunities for identifying new partneships for our future investments and I refer here mainly to our investment in the new manufacturing facility for topical medicines and suppositories. These products have generated a particluar interest in the highly regulated markets such as those in the European Union, Canada and United States of America. Our company’s advantages are its tradition and expertise in manufacturing topical products as well as its formulation facilities, execution of clinical trials and registration documentation, enabling it to access these highly regulated markets. I believe that all of these provide the premises, as set out in the business plan 2016-2020, for a turnover exceeding 400 million LEI in 2020, of which 30% achieved from selling our products in foreign markets ” declared Ioan Nani, CEO of Antibiotice. CphI Worldwide is the meeting place of the most important producers of raw materials around the world, and the Antibiotice team of specialists in research & development, import, export, business development has established more than 200 business meetings. CPHI Worldwide Fair is an opportunity to strengthen the business relationships with our traditional partners from North America, South America, Europe, South-East Asia, CIS and to meet new potential business partners. Our discussions are focused on the selling and promotion strategies for our products, methods of developing the dosage forms and therapeutical classes from our company’s portfolio, identification of new alternative sources of raw materials and active ingredients as well as the negotiation of favourable trading conditions with our suppliers” specified Mihai Stoian, International Business Director. Our participation in a traditional exhibition which imposes the new trends in the worldwide pharmaceutical market, offers us the possibility to stay upgraded , taking into account that the pharmaceutical industry is the most dynamic in the world economy. CPhI Worldwide is the leading global trade fair of active ingredients and related industries. The first edition was held in 1990 in the form of an International Convention in the field of active ingredients and brought together 16 exhibitors and 250 visitors. This year, the fair brought together more than 37,000 participants and 2,500 exhibiting companies from over 150 countries. Spain will host this year’s edition of CPhI Worldwide, the leading event in the international pharmaceutical industry, which will be held in Barcelona between 4-6 October 2016. Antibiotice representatives have planned 190 meetings with business partners across Europe, North and South America and Asia. Business meetings encompass fields such as export, import and developing partnerships on new projects of interest for Antibiotice. 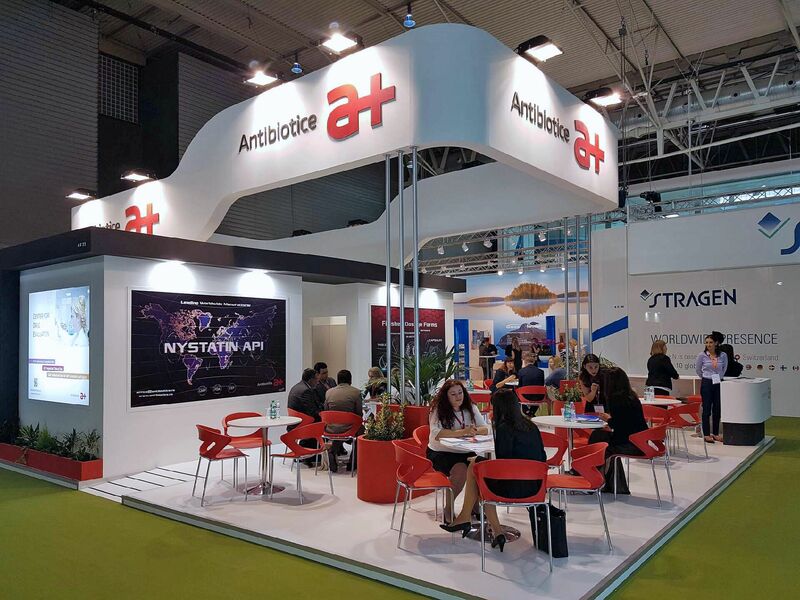 Antibiotice booth at CPhI– 4F 23. CPhI Worldwide, an event in which Antibiotice participates each year since 2003, allows participants to get in touch with the latest trends in the global pharmaceutical industry, opens up new opportunities and offers the opportunity of meeting prospective business partners from around the world.